Our 24 hour pet hospital in Midtown serves Manhattan, including Hell’s Kitchen, Midtown and Upper West Side, along with Union City, NJ, North Bergen, NJ, Long Island City, NY, Hoboken, NJ, and West New York, NJ. BluePearl has New York City covered with four hospitals. 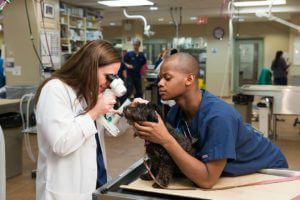 We have 24 hour emergency animal hospitals in Queens, Brooklyn and two in Manhattan, and we are always on duty and ready to care for your pet. If you need a board-certified expert for a chronic condition, we’re also a specialty hospital. Accessible by public transportation, BluePearl Midtown on West 55th Street has a linear accelerator, which allows it to offer radiation therapy for cancer patients. The 20,000-square-foot hospital, formerly known as NYC Veterinary Specialists, also offers radioiodine I-131 treatment for cats with hyperthyroidism. It’s New York and so our Midtown hospital occasionally makes it into a movie or TV show. 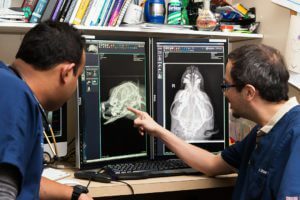 As you might guess, our veterinarians sometimes respond to the medical emergencies of TV and zoo animals, including a hypoglycemic porcupine, a flamingo with a fracture and a tiger with a bad knee, to name a few. Meanwhile, we strive to treat your own pets like the stars they most certainly are.